Spike Lee followed up the premiere of his new political satire “Chi-Raq” not by attending a lavish after party with industry heavyweights and select press, but by joining the people and taking to the streets of New York City for a civil protest from 54th Street to Times Square. The march was keeping in line with the film’s powerful anti-gun violence message, and the fact the movie premiered just hours after Chicago’s police superintendent was fired, as well as on the 60th anniversary of Rosa Parks’ refusal to give up her bus seat, only added a striking resonance and timeless urgency to the proceedings. Co-written with Kevin Willmont, the new Spike Lee joint updates the ancient Greek play “Lysistrata” to the violent streets of Chicago for a blood-boiling statement on the consequences of gun violence in America. Teyonah Parris gives a breakout performance as the play’s eponymous character, who reacts to the murder of a child by a stray bullet by organizing a group of women against the ongoing bloodshed in Chicago’s Southside. In order to make the violence ends, Lysistrata mounts a boycott that finds the women of the city agreeing to remain abstinent until their men put down their guns. While the film weaves comedy and music into a larger dramatic issue, the premiere at the Ziegfeld Theater was as seriously minded as it was socially conscious. The invitation for the event included a line encouraging guests to wear orange, and orange winter hats were passed out at the door for members to wear during the protest. The hats were provided by the nonprofit organization Project Orange Tree, which was started by a group of 15-year-olds after their friend, Chicago native Hadiya Pendleton, was shot and killed while on a playground in her Southside neighborhood. With over 30,000 Americans killed by guns each year, Project Orange Tree encourages people to wear orange, the same color hunters use while in the woods, as a symbol of protection. Keeping with the spirit of these words, much of the crowd joined Lee for the post-screening march, which filled out most of Broadway with orange hats and chants to “put the guns down.” Reverend Michael Pfleger, who Lee referred to as the film’s spiritual advisor and consultant, rousingly proclaimed before the premiere, “This film puts a spotlight on the violence in America and the symptoms and the causes of it and it exposes us to start the conversation. But now it is up to us. If he showed the dirt in our face, we need to do something about it or it’s shame on us,” and it’s this mentality that “Chi-Raq” so vividly channels. 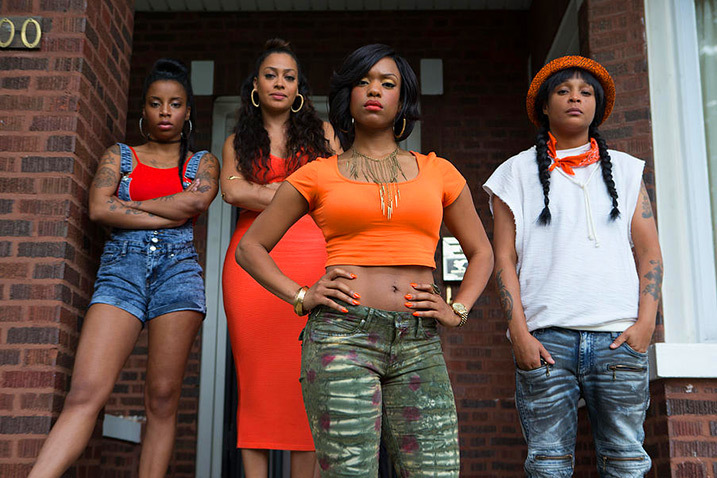 “Chi-Raq” opens in select theaters this Friday, December 4. Check out photos from the march below via the film’s Twitter page.